HCL Technologies is a next-generation global technology company that helps enterprises reimagine their businesses for the digital age. Our technology products, services and engineering are built on four decades of innovation, with a world-renowned management philosophy, a strong culture of invention and risk-taking, and a relentless focus on customer relationships. With a worldwide network of R&D, innovation labs and delivery centers, and 120,000+ ‘Ideapreneurs’ working in 39 countries, HCL serves leading enterprises across key industries, including 250 of the Fortune 500 and 650 of the Global 2000. HCL generated consolidated revenues of USD 7.8 billion for 12 months ended 31st March 2018. Businesses across industries stand at an inflection point today. Far-reaching disruption fuelled by technologies like Digitalization, Analytics, Cloud, IoT and Automation mean these technologies lie at the core of any enterprise that is trying to reinvent itself. 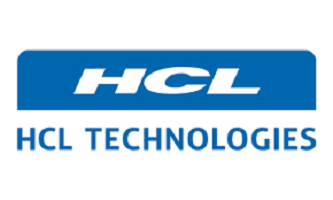 As the demand for these services increase, HCL Technologies is accelerating its evolution into a next-generation technology services firm through HCL’s Mode 1-2-3 strategy. HCL’s Mode 1-2-3 strategy helps future-proof our customers’ business, by deploying a concurrent, three-point spotlight on the existing core of their business, new growth areas as well as the ecosystems of the future. As detailed below, each of the three modes has distinct outcomes and growth potential. (i) Core Services HCL delivers core services in the areas of applications, infrastructure, BPO and Engineering & R & D, leveraging DRYiCE autonomics to transform clients’ business and IT landscape making them “lean” and “agile”. (ii) Next Generation Services HCL delivers experience-centric and outcome-oriented integrated offerings of Digital & Analytics, IoT WoRKS™, Cloud Native Services and Cyber-security & GRC services. (iii) Products & Platforms HCL continues to explore and enter into innovative IP-based partnerships, targeting specific next-generation opportunities. Mode 3 includes the external IP partnership with IBM extending now to half a dozen products; HCL also continues to invest in our internal IP creation strategy and expansion of capabilities and markets for DRYiCE, the next-generation Autonomics and Orchestration platform. HCL’s Mode 1-2-3 strategy is truly differentiating in the marketplace today and our clients are increasingly demonstrating their confidence in this strategy and our ability to deliver. We will continue to build and invest in our Mode 1-2-3 capabilities with the primary goal to be the partner of choice for our clients, globally. Lastly, we will continue to re-skill, train and build the capabilities of our employees to be future-ready. The Board of Directors of the Company, in its meeting held on July 12, 2018, have approved the Buy-back of up to 3,63,63,636 (Three Crores Sixty Three Lacs Sixty Three Thousand Six Hundred and Thirty Six) fully paid up equity shares of the Company of face value of 2 each (representing 2.61% of the fully paid-up equity shares of the Company outstanding as on March 31, 2018 and as on date) at a price of 1100 (Rupees One Thousand and One Hundred) per equity share payable in cash for an aggregate amount not exceeding 4,000 crores (Rupees Four Thousand Crores only). 1. Firstly, to be eligible for the buyback the investor should have shares of HCL Technologies Limited in demat or physical form as on record date [31.08.2018]. 2. Once you have shares in demat, you can participate in the buyback process which is opening from [18.09.2018 to 03.10.2018] by selling your shares through your broker on NSE or BSE. 3. Then on [12.10.2018], the payment will be given to you for accepted shares and unaccepted shares will be returned to your demat account. 2. 181 Shares bought at Rs. 1006 means an investment of 1,82,086. 4. The final Accepted Shares were taken back on 12.10.2018. 5. Overall we can say a profit of 16471 on an investment of 1,82,086 in 3 months which is equivalent to a 36% Annualized return. Have all of you recd the amts in your bank accts today. Surprising that out of 3 accounts, i recd money only in two today. Expect 100% Acceptance Ratio in HCL tech. The Price is nearing to buyback even before opening of buyback for tender. The currency boost has made IT sector a hot commodity for investors. Macquarie has intiated a buy rating on HCL tech, TCS, Infosys, Wipro and Tech-Mahindra in large caps and L&T Infotech in mid cap. HCL tech 1050 as on 10:29 on 31.08.2018. The Record date is today. So people who want to participate in buyback are already bought shares. If the price goes pass 1075 then very big chance of 100% acceptance ratio. Completely agree with you. If the price remains around 1050 then high chances that investors would not wait to tender their shares in the buyback instead sell their shares in the market which ultimately increases acceptance ratio. The same thing happened with TCS, it is very near to its buyback price and most of the investors are selling it now in the open market. 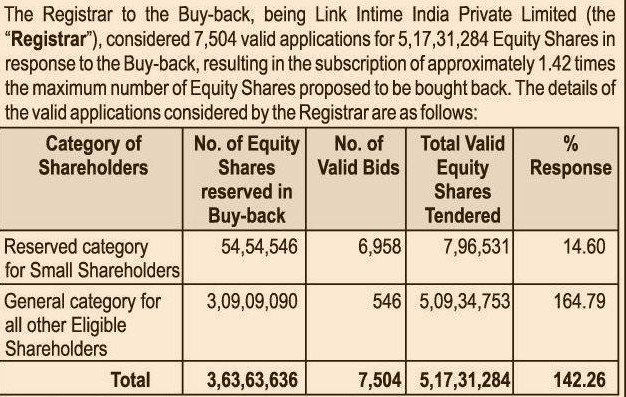 Do we have to pay stt on shares given in buyback ? Yes ,as you are tendering shares via Stock Exchanges , so you have to pay STT. I’m new to buybacks. Just checking but the recent past buybacks like aarti drugs had buyback of 5%. is this right. Arrti drugs [The Buyback opened on 14 February 2018, and closed on 28 February 2018]. 1. No. of Shares Reserved for Retail Category was 41250 and total tendered were 3,21,762. So acceptance ratio was 12.8%. 2. No. of Shares Reserved for General Category was 2,33,750 and total tendered were 1,47,55,848. So the acceptance ratio was 1.5%. Does it still makes sense to purchase HCL stocks @ Rs. 1040 for tendering in the buyback. As per my calculations, there is still a small 2-3% return at 50% acceptance. Just for the sake of buyback then I would not advise buying at the current level that too just for a mere gain of 2-3%. The market is all time high though correction seems to be at distant due to huge demand coming from DII in the market you still never know. So avoid buying at Current levels. Those who bought HCL at 950 only for buyback purpose can technically sell out at 1040-1050 range. The gain at 1040-1050 price would be the same as participating in buyback at 1150. HCL – Pursuant to Regulation 42 of the SEBI (Listing Obligations and Disclosure Requirements) Regulations, 2015 and Regulation 9(1) of the SEBI (Buy Back of Securities) Regulations, 1998, we would like to inform you that the Company has fixed Friday, August 31, 2018 as the Record Date for the purpose of determining the entitlement and the names of the equity shareholders who shall be eligible to participate in the Buy-back. At what price you have bought shares?? What is the expected acceptance ratio of HCLTECH buyback shares? It should be somewhere between 40-50%. Are current HCL tech share price levels of 975 good to buy fresh shares solely for participation in Buyback ? Please advise. Thanks. I feel acceptance Ratio of even 40% will fetch decent 8-10 % profits. Why avoid then ? Any specific reasons ? I think we should wait for another week to discover the price of HCL tech. The Nifty in the August Series may tank up to 10800 level. The RBI meet on 1st August 2018 is a key event to look upon. Any rate hike will seriously impact the market and the way Crude is hovering above 72 level the rate hike may happen. So, I would say wait and watch. HCL total buyback is of Rs. 4000 Cr. To be eligible under Retail quota the upper limit is 2 lacs and at present the CMP of HCL Technology is 986. Therefore, you can buy 200000/986=202 Shares to be elgible for buyback but remember no. of shares will keep on changing as price moves up and down. Better to enter the game at 960-975 price because even if acceptance ratio at 40% will give you good profit. let us suppose you invest 200000 at an average price of 970 then you will get around 206 shares in your demat account. By considering 40% acceptance ratio then 83 shares will get tendered and in that case your profit would be ( 1100-970)*83=10970. The remaining 123 shares you can sell later on in open market or may be in buyback next year. IT Sector is hot these days and have given good return this year. So chances of loss is less. Recent Buybacks are all jokes!